The invasion, by the first army organized by the United States, under the command of Major Gen. Arthur St. Clair, aimed at the destruction of Indian villages along the Maumee River to open the way for “settlers” (as if the land were not already settled—an example of the way language can obscure reality) and land speculators. The success of the Indians thwarted the invasion, scattered the “settlers,” and discouraged the speculators. The Indians’ successful expulsion of American soldiers made front-page news and dashed plans for the Westward Expansion of the “American empire.” Today, few people have heard of the event. History books skip over this battle to focus on the later successful invasion into Indian lands beyond the Ohio by a rebuilt army under Gen. Anthony Wayne. St. Clair’s defeat was not the first time Indian nations demonstrated an ability to field sizable bodies of warriors in a coordinated response to white aggression. 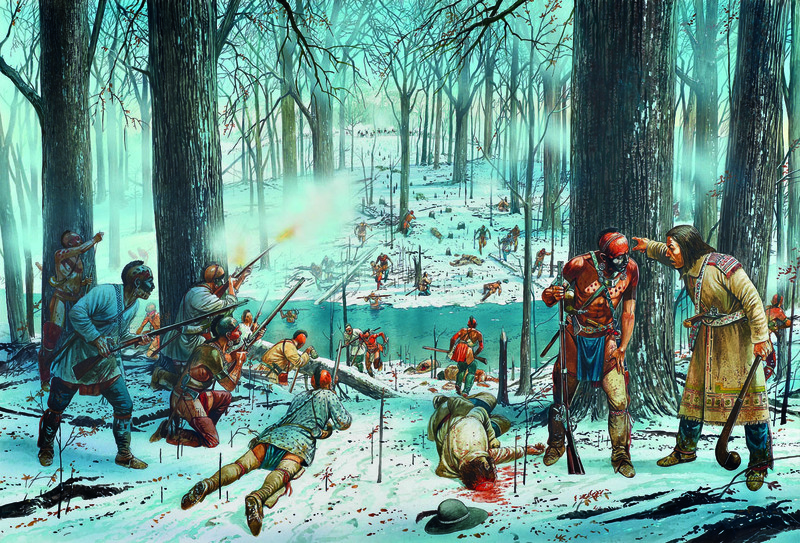 In 1755, Indians defeated the largest British army ever sent to North America, routing troops led by Gen. Braddock and Lt. Col. Gage. Braddock’s aide-de-camp, George Washington, escaped, but the general was killed. American political leaders and commercial interests responded to their defeat by focusing on the failures of the U.S. Army rather than on the achievements of the Indians. Complaints targeted inadequate training of soldiers, missteps of officers, and failures and corruption of the entire supply effort. The “Indian problem” was foremost in the minds of those who engineered the formation of the federal constitution: how to coerce Indians into “obedience” (i.e., how to stop them from resisting the colonizing invasions) and how to “organize” Indian trade (i.e., how to maximize American profit and Indian debts). The question in practical terms for the Americans was which power was most capable of accomplishing these goals: the states or the federal government? Ultimately, the creation of a federal power to deal with Indians also created a federal power to subordinate the states and citizens alike. He adds that the full story reveals how “the George Washington of popular history [was also] the man who speculated in Indian lands, burned Indian towns, and, as commander in chief, was ultimately responsible for losing the nation’s first army.” Calloway calls Washington “a seasoned speculator” in the lands across the Ohio, who “took a decided interest” in pushing the Indians out. Washington’s first annual message to Congress focused on “the common defense,” with the now timeworn notion that “to be prepared for war is one of the most effectual means of preserving peace.” He said “the pacifick measures” aimed at “hostile tribes of Indians” had not been effective. Ultimately, the history of American wars against Indians and the development of a powerful federal government to carry out these wars demonstrates that America has, from the beginning, been a warring nation, built on a war economy. Calloway illuminates the origins of that history, starting with its initial failure. Peter d’Errico graduated from Yale Law School in 1968. He was staff attorney in Dinebeiina Nahiilna Be Agaditahe Navajo Legal Services, 1968-1970, in Shiprock. He taught Legal Studies at the University of Massachusetts, Amherst, 1970-2002. He is a consulting attorney on indigenous issues. Posted on March 11, 2015, in Uncategorized and tagged anti-colonial resistance, anti-colonial warfare, Major Gen. Arthur St. Clair, Wabash 1791, warrior. Bookmark the permalink. Leave a comment.